shop online at www.missourivalleyshopper.com Twenty South Dakotans Selected For Bush Foundation’s Change Network BROOKINGS, S.D. - SDSU Extension is pleased to announce the 20 South Dakotans selected to join the second South Dakota Change Network cohort. "From welcoming new populations in Aberdeen to emphasizing inclusivity in the arts in Vermillion, these participants are driven to improve the places they live and work," said Kari O'Neill, SDSU Extension community vitality field specialist. The Change Network, sponsored by the Bush Foundation, provides South Dakotans, North Dakotans, Minnesotans, and the region's 12 Native nations with a supportive learning environment to lead change within their organizations and communities in a more equitable and inclusive manner. The cohort will spend the next year working oneon-one with mentors and jointly in group discussions while attending online learning sessions and three participant seminars. The following South Dakotans make up the 2018 Change Network Corhort: Golnesa Asheghali, Rapid City; Caitlin Bordeaux, Saint Francis; Keith Braveheart, Vermillion; Casey Burrus, Herrick; Naomi Even-Aberle, Rapid City; Bea Fischer, Aberdeen; Amber Hansen, Vermillion; Heidi Hepola, Aberdeen; Betta Jay, Flandreau; Julie Johnson, Mina; Pam Lange, Belle Fourche; Leslie Larson-Cutshaw, Clear Lake; Sandra Kern Mollman, Vermillion; Tamie Nickelson, Frederick; Emily Firman Pieper, Flandreau; Jay Pond, Rapid City; Paul Schipper, Sioux Falls; Julie Stevenson, Watertown; Cary Thrall, Lead and Erica Weston, Oglala. "We are excited to engage a diverse group of South Dakotans who span multiple backgrounds, professions, ways of thinking, points of view, and ages," O'Neill said. "One of Change Network's greatest strengths is the cohort's ability to learn from and assist each other thanks to their breadth of expertise." More about the Change Network Launched in 2017, Change Network is made possible through the collaboration of 3E Productions, Bush Foundation, CommonSense Consulting@ Work, MillerHale Associates, National Arts Strategies, SDSU Extension and Strengthen ND. Participation in the Change Network is generously funded by the Bush Foundation and includes access to a $5,000 grant to implement a pilot project or support a related ongoing community project. If you read this you know... advertising pays! Call the Missouri Valley Shopper at 665-5884 or stop by to place your ad today! 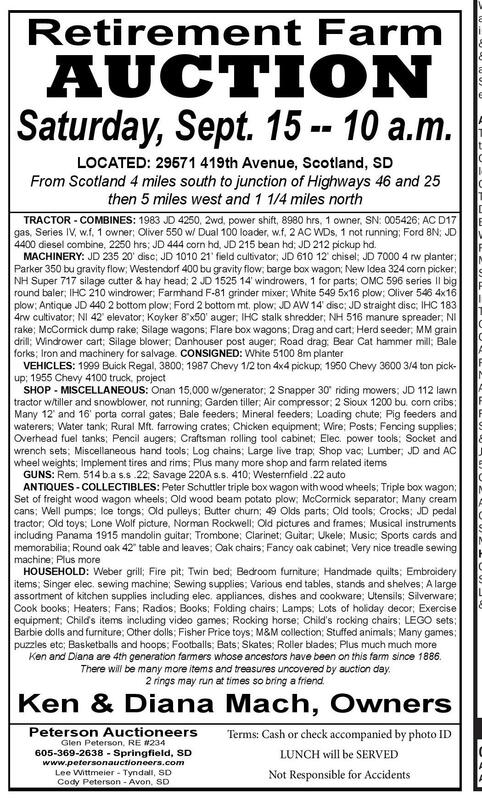 319 Walnut St. • Yankton MV Shopper M I S S O U R I VA L L E Y M I S S O U R I VA L L E Y September 11, 2018 • Page 11 AUCTIONS finding the right job is easier than you think Yankton County Land AUCTION Thursday, Sept. 20 -- 10 a.m. Auction to be held on site Land located from Tabor, SD, 4 miles east on 306th Street when you’ve got the right direction Stop searching. The Help Wanted section of the Missouri Valley Shopper lists many possible new job opportunities. Find a career that’s right for you. 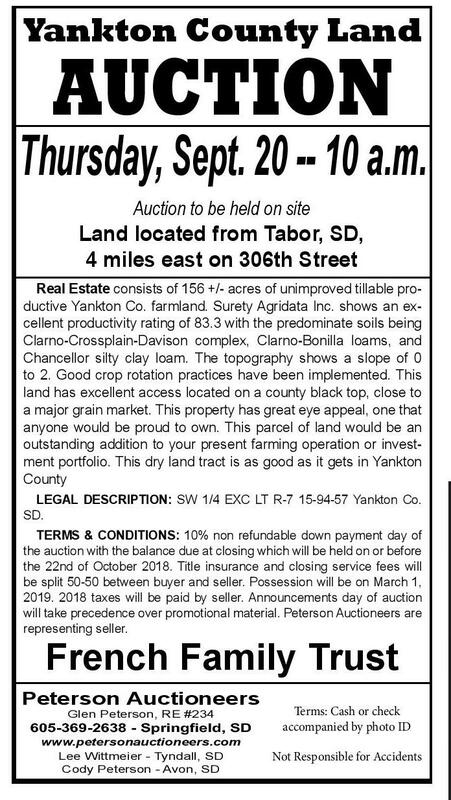 Real Estate consists of 156 +/- acres of unimproved tillable productive Yankton Co. farmland. Surety Agridata Inc. shows an excellent productivity rating of 83.3 with the predominate soils being Clarno-Crossplain-Davison complex, Clarno-Bonilla loams, and Chancellor silty clay loam. The topography shows a slope of 0 to 2. Good crop rotation practices have been implemented. This land has excellent access located on a county black top, close to a major grain market. This property has great eye appeal, one that anyone would be proud to own. This parcel of land would be an outstanding addition to your present farming operation or investment portfolio. 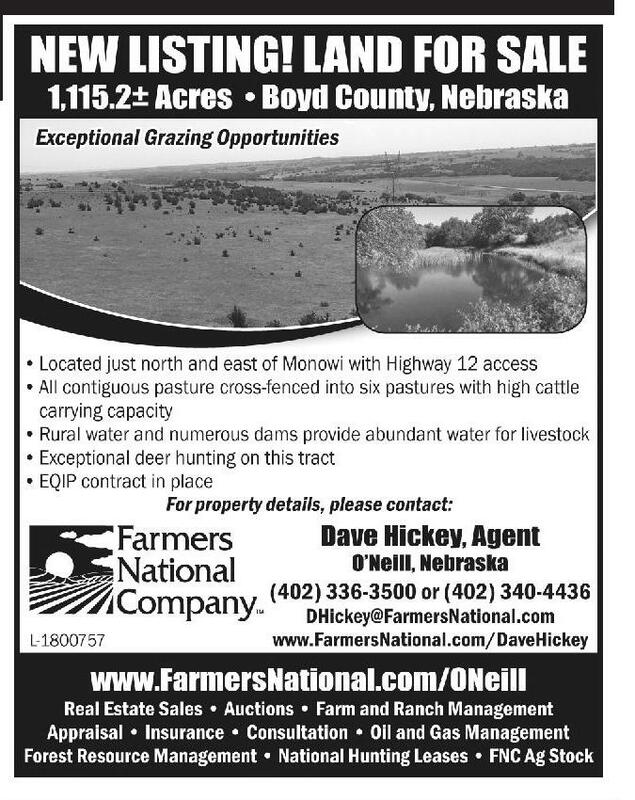 This dry land tract is as good as it gets in Yankton County LEGAL DESCRIPTION: SW 1/4 EXC LT R-7 15-94-57 Yankton Co. SD. TERMS & CONDITIONS: 10% non refundable down payment day of the auction with the balance due at closing which will be held on or before the 22nd of October 2018. Title insurance and closing service fees will be split 50-50 between buyer and seller. Possession will be on March 1, 2019. 2018 taxes will be paid by seller. Announcements day of auction will take precedence over promotional material. Peterson Auctioneers are representing seller. French Family Trust Peterson Auctioneers Glen Peterson, RE #234 Terms: Cash or check accompanied by photo ID MV Shopper MV Shopper Retirement Farm M I S S O U R I VA L L E Y www.petersonauctioneers.com Lee Wittmeier - Tyndall, SD Cody Peterson - Avon, SD Not Responsible for Accidents M I S S O U R I VA L L E Y AUCTION Saturday, Sept. 15 -- 10 a.m. 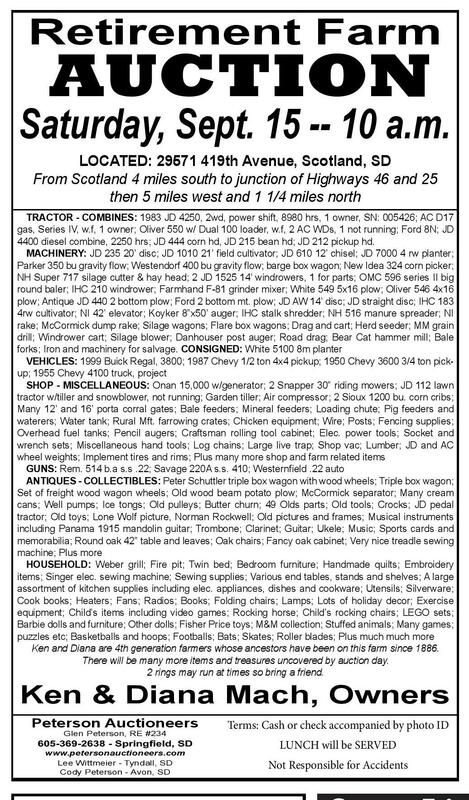 LOCATED: 29571 419th Avenue, Scotland, SD From Scotland 4 miles south to junction of Highways 46 and 25 then 5 miles west and 1 1/4 miles north TRACTOR - COMBINES: 1983 JD 4250, 2wd, power shift, 8980 hrs, 1 owner, SN: 005426; AC D17 gas, Series IV, w.f, 1 owner; Oliver 550 w/ Dual 100 loader, w.f, 2 AC WDs, 1 not running; Ford 8N; JD 4400 diesel combine, 2250 hrs; JD 444 corn hd, JD 215 bean hd; JD 212 pickup hd. MACHINERY: JD 235 20’ disc; JD 1010 21’ ?eld cultivator; JD 610 12’ chisel; JD 7000 4 rw planter; Parker 350 bu gravity ?ow; Westendorf 400 bu gravity ?ow; barge box wagon; New Idea 324 corn picker; NH Super 717 silage cutter & hay head; 2 JD 1525 14’ windrowers, 1 for parts; OMC 596 series II big round baler; IHC 210 windrower; Farmhand F-81 grinder mixer; White 549 5x16 plow; Oliver 546 4x16 plow; Antique JD 440 2 bottom plow; Ford 2 bottom mt. plow; JD AW 14’ disc; JD straight disc; IHC 183 4rw cultivator; NI 42’ elevator; Koyker 8”x50’ auger; IHC stalk shredder; NH 516 manure spreader; NI rake; McCormick dump rake; Silage wagons; Flare box wagons; Drag and cart; Herd seeder; MM grain drill; Windrower cart; Silage blower; Danhouser post auger; Road drag; Bear Cat hammer mill; Bale forks; Iron and machinery for salvage. CONSIGNED: White 5100 8m planter VEHICLES: 1999 Buick Regal, 3800; 1987 Chevy 1/2 ton 4x4 pickup; 1950 Chevy 3600 3/4 ton pickup; 1955 Chevy 4100 truck, project SHOP - MISCELLANEOUS: Onan 15,000 w/generator; 2 Snapper 30” riding mowers; JD 112 lawn tractor w/tiller and snowblower, not running; Garden tiller; Air compressor; 2 Sioux 1200 bu. corn cribs; Many 12’ and 16’ porta corral gates; Bale feeders; Mineral feeders; Loading chute; Pig feeders and waterers; Water tank; Rural Mft. farrowing crates; Chicken equipment; Wire; Posts; Fencing supplies; Overhead fuel tanks; Pencil augers; Craftsman rolling tool cabinet; Elec. power tools; Socket and wrench sets; Miscellaneous hand tools; Log chains; Large live trap; Shop vac; Lumber; JD and AC wheel weights; Implement tires and rims; Plus many more shop and farm related items GUNS: Rem. 514 b.a s.s .22; Savage 220A s.s. 410; Western?eld .22 auto ANTIQUES - COLLECTIBLES: Peter Schuttler triple box wagon with wood wheels; Triple box wagon; Set of freight wood wagon wheels; Old wood beam potato plow; McCormick separator; Many cream cans; Well pumps; Ice tongs; Old pulleys; Butter churn; 49 Olds parts; Old tools; Crocks; JD pedal tractor; Old toys; Lone Wolf picture, Norman Rockwell; Old pictures and frames; Musical instruments including Panama 1915 mandolin guitar; Trombone; Clarinet; Guitar; Ukele; Music; Sports cards and memorabilia; Round oak 42” table and leaves; Oak chairs; Fancy oak cabinet; Very nice treadle sewing machine; Plus more HOUSEHOLD: Weber grill; Fire pit; Twin bed; Bedroom furniture; Handmade quilts; Embroidery items; Singer elec. sewing machine; Sewing supplies; Various end tables, stands and shelves; A large assortment of kitchen supplies including elec. appliances, dishes and cookware; Utensils; Silverware; Cook books; Heaters; Fans; Radios; Books; Folding chairs; Lamps; Lots of holiday decor; Exercise equipment; Child’s items including video games; Rocking horse; Child’s rocking chairs; LEGO sets; Barbie dolls and furniture; Other dolls; Fisher Price toys; M&M collection; Stuffed animals; Many games; puzzles etc; Basketballs and hoops; Footballs; Bats; Skates; Roller blades; Plus much much more Ken and Diana are 4th generation farmers whose ancestors have been on this farm since 1886. There will be many more items and treasures uncovered by auction day. 2 rings may run at times so bring a friend. Ken & Diana Mach, Owners Peterson Auctioneers Glen Peterson, RE #234 TINKER CONCESSIONS LOCATED: At the Ronspies’ Farm – 14 miles north of Norfolk, Nebraska on US Hwy 81Or from the junction of US Hwy 20 & 81 west of Randolph, Nebraska, 7 miles south on US Hwy 81 AUCTIONEERS NOTE: Make your plans to join us for this fine auction. In 2012 we had the opportunity to sell the Will & Alice Ronspies Tractor & Car Collection in a 4-day auction. At that time the items in the farm house were not included in that auction. Time has passed, and now Lisa & John have decided to liquidate the remainder of the Will & Alice Ronspies Estate at auction. Many more items that are not included in this listing will be sold. Visit our Web Site www.CHJAUCTIONEERS.COM for several photos of the excellent items to be sold. ANTIQUES & COLLECTIBLES: Extremely Ornate Round Oak Table w/ Claw Feet (Ends of this table will drop to convert to Drop Leaf), Set of (6) Pressed Back Chairs, Oak Kitchen Cabinet w/ Possum Belly Drawer, Oak “Bay State” 3 Door Ice Box, Mahogany Dinning Room Set w/ Table, Leaves, (6) Chairs, China Hutch & Server/Buffet, Oak “C” Roll – Roll Top Desk w/ Oak Office Chair, Gentleman’s Dresser, Pine 2 Door Cabinet w/ Panel Doors, Spoon Carved Wooden High Back Bed, Spoon Carved Dresser w/ Mirror, Spoon Carved Wooden Commode w/ Towel Bar, Edison Table Top Cylinder Record Player w/ Tower Speaker & Cylinder Records, Regina Music Box Disks, Mustard Colored Painted Cupboard, Glass Store Display Case w/ Sliding Doors, Parlor Tables, Several Pine Benches, Faux Leather Sofa/Hide-A-Bed, Unique Cast Iron Bench, Knee Hole Desk, Painted Drop Front Desk w/ Top Book Shelves, Floor Lamps & Cane Seat Chairs, Large Oak Beveled Mirror, Asst. of Interior Doors, Pump Organ, Cast Iron Soap Kettle, Several Trunks, Wooden Duck Decoys, Arcade Wall Mount Coffee Grinder, Cuckoo Clock, Asst. of Roseville Pottery Pieces – Including Vases, & Book Ends, Nice Asst of Pictures & Frames of All Types, Mantel Clocks, Asst. of Room Rugs, Harness Rings, Nice Offering of Vintage Records – Including Elvis & More, Several 45 RPM Kids Records, DisneyKins – Give-A-Way – from RCA Victor Dealer, Stamp Albums & Stamp Blocks, Wheat Pennies, Morgan & Peace Dollars, Early “Nebraska Illustrated Book”, Crock Jugs, Sad Irons, Stove Parts, Wooden, Butter Churns, JDD 5 Gallon Cans, Burlap Potato Sacks, Décorative Tin Pieces, Cream Cans, Older GE Télévisionm, Stain Glass Window, Many Vintage Ladies Hats, Gold Edge Stemware Glasses, Asst. of Silverware, English Iron Stone China “Baltic”, Asst. Of Wooden Chairs, Etude Magazines, Floor Model Victorla, Shaving Stand, Western Butter Churn & Glass Butter Churn, Many More Primitives & Misc. Small Collectibles HOUSEHOLD, MISCELLANEOUS & TOOLS: “Jet 3” Handi Cap Electric Scooter, Small Dorm Size Refrigerator, Newer 5 Section Bookcase, Metal File Cabinets, Metal Drawer Units, Large Electric Shop Fan, Asst. of Hand Tools, Garden Tools & More, Plus an Asst. of Miscellaneous Household Items WILL & ALICE RONSPIES ESTATE LISA & JOHN ARIETA – OWNERS This auction will be held indoors. TERMS OF AUCTION: CASH DAY OF SALE, NO PROPERTY TO BE REMOVED UNTIL SETTLED FOR. EVERYTHING SOLD AS IS – WHERE IS AND BECOMES THE RESPONSIBILITY OF THE SUCCESSFUL BIDDER. PROPER ID WILL BE REQUIRED FOR A BIDDING NUMBER. WWW.CHJAUCTIONEERS.COM LUNCH will be SERVED CREAMER HEIMES JANSSEN AUCTIONEERS & APPRAISERS L.L.C. 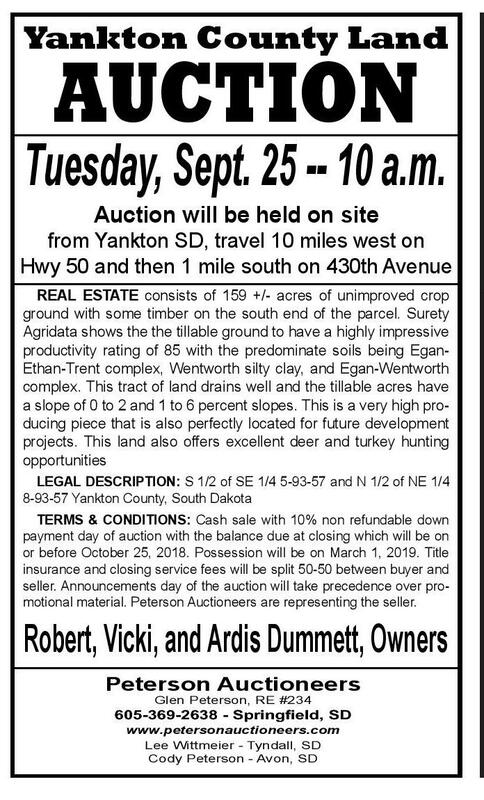 Not Responsible for Accidents Yankton County Land AUCTION Tuesday, Sept. 25 -- 10 a.m. Auction will be held on site from Yankton SD, travel 10 miles west on Hwy 50 and then 1 mile south on 430th Avenue REAL ESTATE consists of 159 +/- acres of unimproved crop ground with some timber on the south end of the parcel. Surety Agridata shows the the tillable ground to have a highly impressive productivity rating of 85 with the predominate soils being EganEthan-Trent complex, Wentworth silty clay, and Egan-Wentworth complex. This tract of land drains well and the tillable acres have a slope of 0 to 2 and 1 to 6 percent slopes. This is a very high producing piece that is also perfectly located for future development projects. This land also offers excellent deer and turkey hunting opportunities LEGAL DESCRIPTION: S 1/2 of SE 1/4 5-93-57 and N 1/2 of NE 1/4 8-93-57 Yankton County, South Dakota TERMS & CONDITIONS: Cash sale with 10% non refundable down payment day of auction with the balance due at closing which will be on or before October 25, 2018. Possession will be on March 1, 2019. Title insurance and closing service fees will be split 50-50 between buyer and seller. Announcements day of the auction will take precedence over promotional material. Peterson Auctioneers are representing the seller. Robert, Vicki, and Ardis Dummett, Owners Peterson Auctioneers www.petersonauctioneers.com Lee Wittmeier - Tyndall, SD Cody Peterson - Avon, SD SAT., SEPTEMBER 15, 2018 AUCTION STARTS at 9:30 AM Terms: Cash or check accompanied by photo ID www.petersonauctioneers.com Lee Wittmeier - Tyndall, SD Cody Peterson - Avon, SD Glen Peterson, RE #234 ANTIQUES & COLLECTIBLE AUCTION AUCTIONEERS: RYAN CREAMER 402-254-9753 ALTON HEIMES 402-254-3315 ROGER JANSSEN 402-388-4409 Store Liquidation Auction 12:00 • Sunday, Sept. 16, 2018 National Guard Armory (603 Princeton) Vermillion, SD Lunch Served Full listing and photos go to dakotarealty.com Auctioneer notes: Terms: Cash, good check, or card (4% processing fee on cards) not responsible for accidents/theft. Coins: 1800’s silver dollars, foreign and misc. coins. Antiques: “Acorn” twin and full bed frames, 4 antique dressers, drill press, school desk, steel wheels, model T wheels, antique recliner, Retro 4 chairs with rose design, noritake dish sets, depression glassware; green, pink, yellow, gold, blue, Pyrex, fireking, corning ware, carnival, metal ware, milk glass, and over 50 sets of salt and pepper shakers, milk bottles, liquor decanters. Furniture: Oak table sets with 4 chairs (5), restaurant tables (14), misc. chairs (16), solid wood book shelves (4), various other bookshelves, stainless steel sinks (2), food warmers (2), various small appliances, bed frames. Collections: Large Coca-Cola collections, Native American, salt and pepper, pigs, cows, roosters, chickens, owls, elephants, modern tone dish set, metal tins, tea cup & saucers sets, safari items, children’s tea sets, cookbooks, fishing poles & supplies. Misc. : 100 + new shoes, 300+ jewelry, new small appliances, framed pictures, Thomas Kinkad, 200+ DVD’s, 200+ CD’s, various stereos, DVD players, CD players, VCR’s, 45’s records, clocks, clock radios, toys, beer signs. Store supplies: Clothing racks, Slatwall tower rack, tiered (3-4) shelf units, display racks, gondola unit, light fixtures, pizza oven, commercial mixer, 20 shopping carts. 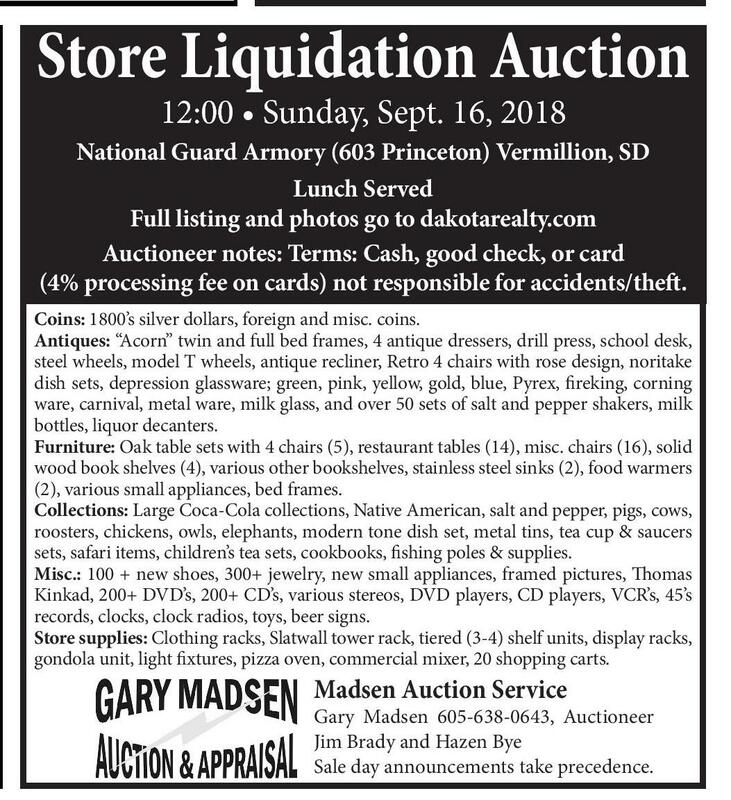 Madsen Auction Service Gary Madsen 605-638-0643, Auctioneer Jim Brady and Hazen Bye Sale day announcements take precedence.